One can’t do everything, but everyone can do something! 2011 ended in everyone’s own way. I partied hard with my friends, seniors and some friends spent the night doing barbeque at a hill, a friend spent it riding and camping across the jungles and so on. But, when it came to Welcome the Year 2012, we, Bisons, rode to meet the '16-till-I-die' ladies of Assisi Bhawan. 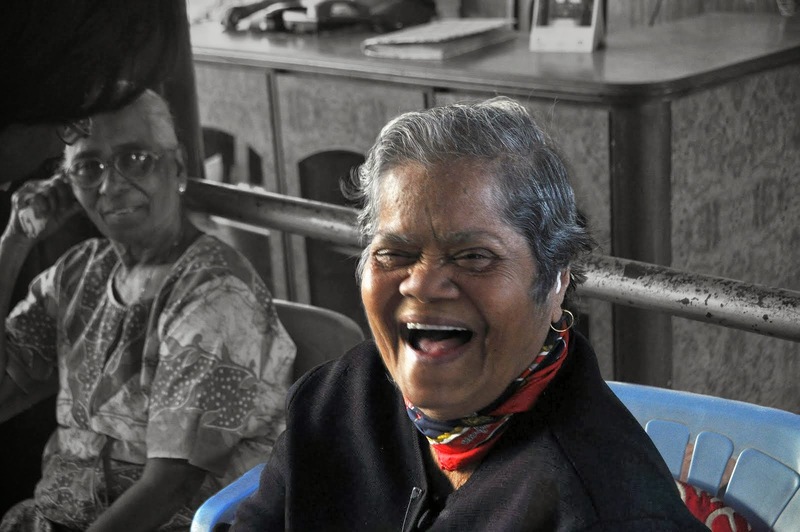 Assisi Bhawan, located at Goregaon, is home to old age people, mostly women. Bison Sheldon proposed and planned this sacred ride for BisonsRideHard. Sacred, as it was a call of our souls and not just a hobby ride. Some 40 Bullet riders, Bisons and aspirants, from all over the Greater Mumbai gathered at BKC with some small gifts for the Assisi residents. A small prayer and we left BKC with a bisonian roar, following Ride Captain Sheldon in wedge formation, we reached Bhawan at about 5 PM. Sister Catherine and a number of ladies were already waiting for us in the Bhawan’s lobby. When we reached the place, while most were engrossed in our inspection, one lady came forward and informed us that they are just 16 years old ladies and need that treatment only! Minutes later, she has attracted few of Young Bisons, including me. First thing that she asked me was to guess her name. I asked for clue, and the reply was 2 Minutes! She looked at SriRam and Aditya, and said, “I told you, this boy is smart too”! She later showed us her bed, her two-soft toys-pets and the wardrobe bought when she moved in to the Bhawan, 17years ago, with her husband. It touched me, her old yet glittering eyes and let-me-tell-you attitude----I was moved! 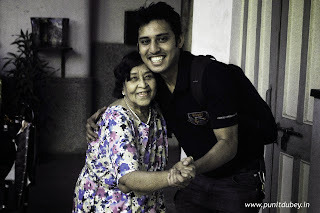 I got clicked with the lady, who later told everybody that I was her young boyfriend, but she did like SriRam also. Rita had a lot of stories from young days to tell, stories about her husband, how they met, where he used to work, how she was better in dance than another lady with long legs, and so on…. Bison Archana sang ‘Chalte-chalte’ for them, with us as chorus, and Derek sang his mom’s favourite ‘Again-again’ song. They were so happy and participating. Rita then spoke her heart out and with other fellow ladies prayed for us. It was the simply a phenomenal shower of blessings! We had only 2hours schedule for the Bhawan. It was also some family-function day for them. The ladies have no sort of frowning, no expectations, they were so much happy with whatever the Almighty has thought for them. I seriously couldn’t find a single wrinkle of frustration on any forehead in the Bhawan, which is so common when I meet people in offices, on road or even on trips! They were so amazed to know that we ride long on our bullets, and some ladies asked us to ride them to RM-Delhi too! What really touched my soul was that they weren’t at all concerned about what we brought for them or what we may next time, but just some more time to spend with them. Rita, Maggy and many other ladies complained that we came there for just 2hours, and whenever it is next time, it should be a whole day long…. Awesome post bhai! It was indeed a heart warming to see all the young ladies. But I get very uncomfortable in these social occasions and usually tend to my own business which is what I was doing this time too! Let's build more such memories; and good times this year! It was really a great ride, one of the best I had.... I love doing my bit... You must have come too, chalo we'll ride and build such more memories coming years too.... Thanks bhai!